To go along with the out of control kitchen. I should have known. Doubling the size of my garden, and doubling the amount of sunlight daily would result in a quadrupling of the amount of tomatoes we harvest. 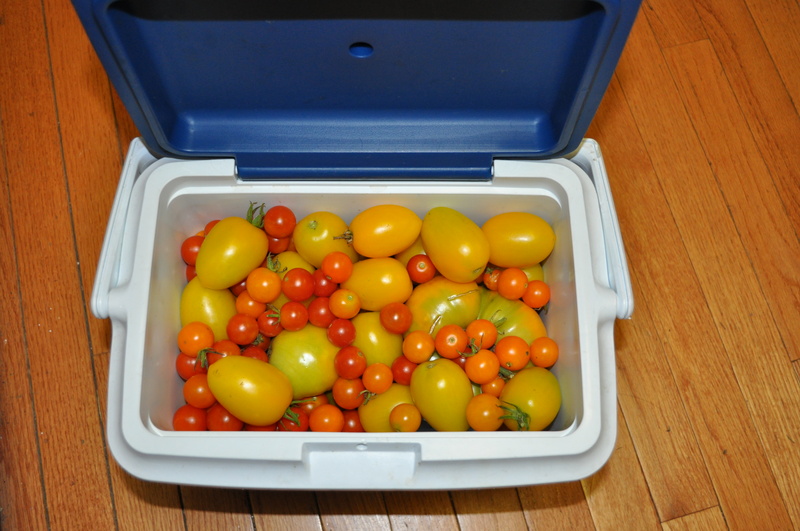 The ten pounds of tomatoes harvested yesterday. To join that ten pounds from Friday. 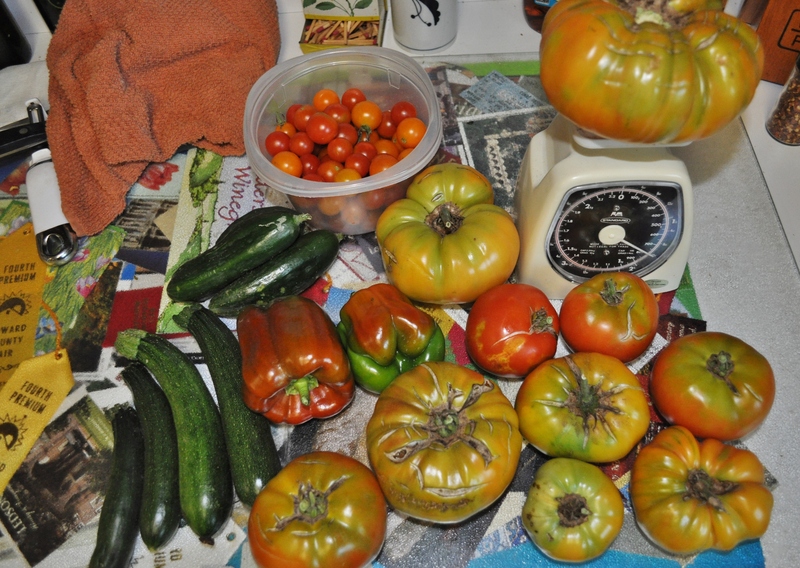 All told, more than 76 pounds of tomatoes so far this year. The zucchinis are still producing. So are the cucumbers. And I really should have entered that big one in the fair. At 1 3/4 pounds I think it would have gotten second place. The winner, I believe, was 1.9 pounds. We have tomatoes for at least two meals a day. The oven roasting, oven drying, tomato sauce, salad making, gifts, etc. are hardly making a dent in it. I had more plants last year with less than half this harvest. Note to self. Do NOT plant this many tomatoes next year. I have been busy. Pickling. Canning. Cooking. I even slow cooked a dozen onions to make caramelized onions to freeze. Since I am doing the event at the Howard County Conservancy next week, I am creating a page to use as my “handout”, for participants to use for referral after coming to the event. The page, which you can see above the posts, will include recipes and technique posts. The focus of my blog posts for the next ten days will be the advice I am providing relative to the “Putting Food Away” event. After all, when your garden goes nuts, you need to find something to do with all this food. Posted in Food, Gardening, Howard County, Volunteering and tagged cooking, Food, foodie, gardening, heirloom tomatoes, howard county conservancy, tomatoes, volunteering. Bookmark the permalink. awesome. the 76 pounds and the sharing – good for you!